10th August 2017. 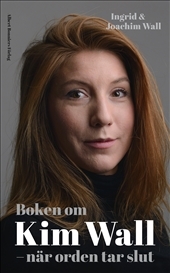 Kim Wall leaves the home she shares with her partner Ole to write a story about a submarine and its builder, in Copenhagen. Several witnesses watch them cast off in the harbour. Just another day at work for a freelance journalist, who loves writing about subcultures and underground factions. Soon, she is meant to be moving to Beijing with Ole, a new life is waiting for her. But Kim never comes back. Instead of writing the headlines, she becomes the headlines. The book is centered on two main themes: the journey her parents undertook after being awoken by a phone call in the middle of the night to hear Kim had gone missing. Their story is one of grief, joy, love, and the yawning, great void in their lives. It’s about questions that never get answered. And it’s about what lies ahead in their tireless efforts to keep Kim’s memory alive. The second theme concentrates on Kim and her life: her story from growing up a curious girl in the south of Sweden, to the driven, talented foreign correspondent and journalist she became—without ever losing her curiosity. This book is a celebration of Kim Wall’s extraordinary life.